“Our NICOLE gown has a ruched bodice, a camo waist inset in your choice of patterns, and hand-beaded sequins on the straps. The camo inset has a hand-beaded and hand-sequined lace edging above and below it. This lace edging will match the chiffon color you choose.This dress comes standard with a zip-up back, but a corset back with modesty panel can be added, if desired. An optional small train can be added to the back of the dress as well. 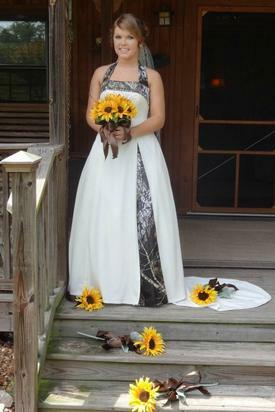 The dress can be made in your choice of chiffon color and camo pattern, which makes it an excellent choice as a Mother-of-the-Bride gown or for any other formal occasion. This style is also offered as a short dress (please see the dress, HARPER item ATOC-0515C, under proms and bridesmaids). This dress comes fully lined with built-up bra cups, built-in bra straps, triple layered fabric, and 8-12 bones for support. 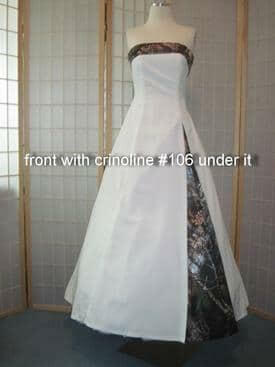 NICOLE will also be sewn with attached netting/crinoline to provide a fuller look at the bottom.